Birds will find most of their food in the wild. They do not really need us to feed them, but it is fun and educational. To keep them from eating you out of house and home, set a limit on the amount of feed you will give the birds each week. The birds will adjust to the amount you give them. Small birds do not feel safe crossing large open spaces because of hawks. Place your feeders near shrubs and trees, but not too close, because cats and other predators can hide there. Some seed on the ground will attract ground feeders like juncos, mourning doves, and various sparrows. It is good to have more than one feeder so the birds will not fight over the food. Keep your feeders clean and dry. If the seed becomes wet, remove it, wash the feeder and dry it before adding new seed. Moldy seed can make birds sick or even kill them in some circumstances. 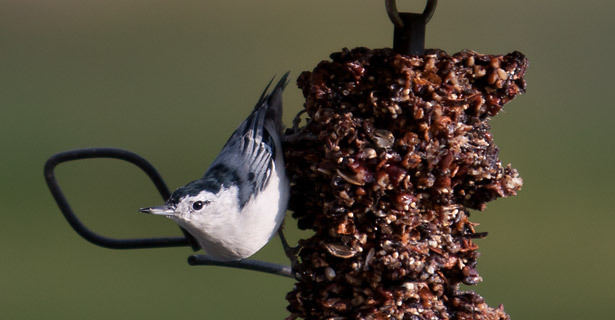 Black oil and striped sunflower seeds attract many birds – including cardinals, woodpeckers, goldfinches, purple finches, chickadees, titmice, and nuthatches – and there is little waste. Nyger seed is best for attracting goldfinches as well as redpolls and pine siskins during the winter. It is not legal to feed bears in Pennsylvania. Put your feeders out of their reach, or only feed birds from mid-December to March when the bears are in their dens. When you decide to stop feeding, do it gradually over a period of a week or so to wean the birds from your banquet table. 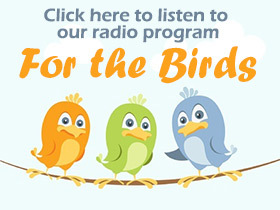 Click here for more bird feeding tips from Audubon Magazine. On Friday, fishermen and conservationists alike got a very important vote from the Atlantic States Marine Fisheries Commission on menhaden. The statement from the Pew Environment Group and a NY Times article appear below. Peter Baker of the Pew Environment Group issued the following statement on Friday’s vote by the Atlantic States Marine Fisheries Commission on management of the Atlantic menhaden fishery. “Today the Atlantic States Marine Fisheries Commission listened to the science and the public in taking a historic step to end overfishing of Atlantic menhaden and to begin to rebuild the population of this important little fish. By adopting the first coastwide catch limit on this fishery, the commission has begun to reverse the 90 percent plunge in the menhaden population over the past three decades. Sound science clearly calls for leaving more of these fish in the water to fulfill their ecological role. 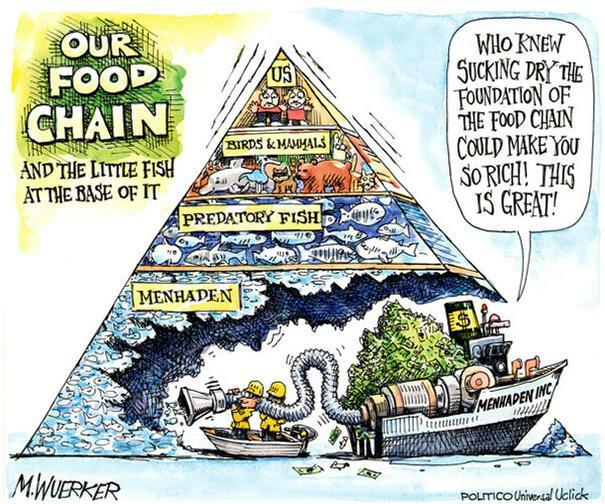 more menhaden means more food for ocean wildlife, from seabirds to whales and popular game fish such as striped bass. What’s a fish to do? During the past month, we were asked to sign a letter in support of strict rules on overfishing of a small fish most of us have never heard. The fish is the Atlantic Menhaden and it is a very important prey species for a lot of creatures including Stripped Bass, Osprey, Common Terns and Puffins. In recent years, the fishery is in decline because of liberal catch limits. Action is needed because a crisis is in the making not only for the predators but other businesses that rely on the fish for existence. The letter was sent to the Atlantic States Marine Fisheries Commission. Some of the uses of this fish include grinding it up for animal feed, extracting its oil which is used in the cosmetic industry for lipstick. The accompanying cartoon makes all to clear as to who is on the loosing end of this unregulated activity. You can read a copy of the letter that NEPAS sent to Gov. Corbett urging him to support stronger regulation of the fishery. The letter and sign on to the ASMFC was one of 128,000, the most sent in the 70 year history of the ASMFC! We will keep you informed of the outcome due this month.